The isle of Madagascar lies about 250 miles off the southeast coast of the African continent. It is a land of high plateaus, steep escarpments and arid plains. The eastern edge of the island has a mountainous spine which is forever shrouded in mists that catch the water-laden trade winds after their long sweep across the Indian Ocean. On the west coast, the island boasts many good harbours, innumerable coves with beaches that are ideal for careening ships, ample fresh water and provisions (including citrus fruits such as limes and oranges, essential in the prevention of scurvy on long voyages). All of the good food offered is important to sea-weary sailors and they appreciate the island’s “vast numbers of good fat, beef”, chickens, eggs and fresh fruit (“Gone to Madagascar for lymes” is a message often left at pirate meeting places). Thick forests cover the mountains that divide the island’s primitive tribes, which seem to be incessantly at war with one another – this has made it easy for the pirates to carve out a place for themselves by helping chieftains in battle and receiving slave prisoners. Madagascar has been described as a “world apart” due to the abundance of exotic, rare and unique plant and animal life (there are 33 species of lemur on the island!). In short, the island of Madagascar is an exotic and tropical paradise. Such a paradise that many pirates, having once visited, return to settle down on the island. Life on Madagascar is carried out at a different pace and men take more than one wife. Soon, they have as many as four or five wives and following on from that, many, many children. In the space of a few years, an ex-pirate could have himself his own tribe – wives, children, dependents and followers. A tribe needs a home and a home needs defending (after all, the ‘neighbourhood’ is inhabited by pirates, cutthroats and warring tribes!). Dwellings are more like fortified citadels than a collection of simple huts. In their plan of fortification, they choose an area that has become overgrown, dense with trees and shrubs, situated near a source of fresh water. They then raise a rampart around this area (which in turn will be surrounded by a ditch), so high and straight, that unless you come prepared with a scaling ladder, they are impossible to climb. Over the ditch itself there is only one path into the woods. The dwelling itself could be situated anywhere within the woods that the ex-pirate deems suitable and will be well camouflaged so that you won’t know it was there until you are right on top of it. But the most cunning part of the defences lay in the passage which led through the woods to the hut. The paths are so narrow that no more than one person can go abreast and arranged in such an intricate manner that they form a maze, traveling round and round in circles, occasionally intersected with cross-ways. These labyrinths are such, that any person not acquainted with the paths might walk for several hours round and across these ways without being able to find the dwelling. Also, all along the sides of the paths large thorns from local trees are stuck in the ground with their points uppermost and the path itself made crooked and serpentine. Anyone attempting to approach the dwelling under cover of the night will almost certainly strike upon these thorns and alert the occupants to the presence of an interloper. To make up for the lack of decent harbours and anchorages on the east coast of Madagascar there is a small island, the Isle Sainte Marie (called Saint Mary’s by the English) which has one of the best harbours in all of Madagascar. Ten miles from the northeastern coast of Madagascar, Sainte Marie is a long, narrow island with a bulge in the middle. The climate is usually hot and humid. Towards the southern end on the western (or leeward) side of the island is the harbour which has a small island, named Ilot Madame, at its mouth that narrows the approaches and makes Sainte Marie easier to defend. Despite stories of a formidable fortress and a large colony, the pirate settlement on Sainte Marie is, in reality, a ramshackle affair. There are a few houses, a low palisade and some cannon. Despite how close the African coast is to the island, most of the inhabitants of Madagascar are descended from Indonesians who arrived on the island by making use of the eastern Trade Winds. There were, however, some Africans who also made the journey, traversing the Mozambique Channel. The inhabitants lived in relative isolation for a number of centuries before the expansion of the Arabic nations, traveling down the east coast of Africa, crossed over to the island sometime in the ninth century. The Arabs made very little impact on the island as they only carried out a limited slave trade. Europeans first became aware of the island when the Portuguese explorer Diogo Dias was swept wide of the Cape of Good Hope during a violent storm in 1500. Diogo ended up drifting along the east coast of the island after the storm had dissipated and before he crossed back over to Africa. The island was originally named the Isle of Saint Laurence by the Portuguese, but before long the local name of Madagascar became accepted as its designation and was indicated on maps as such. The Portuguese and other European merchants regarded the island as a strategically important site as it stood near to the East-West trade routes and could be used as a way station on the journey to and from Asia. Rumours and tales abound concerning the standard of life to be had out at Madagascar - tales were told of how bountiful a place it was, how healthful the atmosphere. Better than Virginia some said. But Madagascar didn’t live up to its reputation. In 1598, the Dutch settled on the isle of Mauritius (about 300 miles east of Madagascar) and used it as a staging post for Far Eastern trade. Even though Mauritius had no native population, the Dutch managed to wreak all manner of disaster on the islands ecology – they cut down much of the forests for ebony (they occasionally raided Madagascar to avail themselves of slave labour for the task), they introduced, albeit accidentally, rats to the island – in the absence of any natural indigenous predators, the rats ate everything in sight, and Europeans also discovered the delicious dodo, a large flightless bird which they hunted to extinction. The Dutch finally abandoned the island in 1712. Colonisation of Madagascar itself proved to be difficult. The English made their attempt in 1644 when a group of merchants lead by William Courteen and Thomas Kynnaston tried to establish a colony at Saint Augustine bay on the southwestern tip of the island. Unfortunately, the timing of the expedition meant that it was the dry season when the settlers arrived and so they could not grow any crops. Their survival was further threatened when local natives came and stole their cattle before attacking the colonists themselves. Soon eighty of the English had died and so the remaining sixty abandoned the colony and headed for India. Although the island’s advocates still described it in glowing terms, the English never again attempted colonisation of Madagascar. The most persistent efforts to colonise were made by the French. They founded a settlement in 1643, called Fort Dauphin, named after the future King Louis IV who was at the time Dauphin of France, on the southeastern tip of the island. Despite the lack of supplies and an almost constant series of attacks and pillaging by the locals, the hardy French colonists managed to hold out until 1674 when the settlement was finally destroyed by the natives. Even though the European’s attempts at colonisation proved to be unsuccessful, trading with the local chieftains and their tribes became very lucrative – for European and American trader alike. The local chiefs were especially eager to trade slaves that they had captured in battles with other tribes, for gunpowder and firearms. Using the advantage of firepower, native warlords were able to capture even more slaves than before. Often, half of the number of captives would be traded with the arms merchants. And so, the Malagasy Slave Trade was born. The slave prices were very low due to the market being outside of the more mainstream African slave trade, so it made the long journey from Europe and the Americas worthwhile. For thirty years or so, between about 1690 and 1723, Madagascar became haven to pirates, who used the island as a safe port from which they would sail and prey on the rich trade of the Indian Ocean. Toward the end of the 1700s, piracy in the Caribbean was on the decline – the Age of the Buccaneers was coming to a close. They were being driven out of their favourite haunts and hangouts. Tortuga was beginning to settle down under French rule (see Part One “The Piratical History of Tortuga”) and Port Royal was still reeling under the shock of the Great Quake of 1692, a blow from which it’s piratical population would never recover (a forthcoming installment). The Spanish treasure fleets were less and less frequent and risks were increasing through better naval patrols. It was a time of peace throughout Europe and subsequently privateers were not needed. Stories began to reach the Americas and other western colonies. Rumours, tales and gossip concerning rich Moorish vessels waiting to be taken by anyone enterprising enough to make the journey across the Atlantic and into the Indian Ocean. Before long, the American and Caribbean pirates began to make the long voyage around the Cape of Good Hope beginning what was to become known as the “Pirate Round”. The favourite targets for the pirates were the Moorish ships traveling between Mocha and India. The Isle of Perim (also known as Bab’s Key), situated at the mouth of the Red Sea, was the ideal place for pirates to lie in wait for their victims. The only problem was that there was no fresh water to be had there. 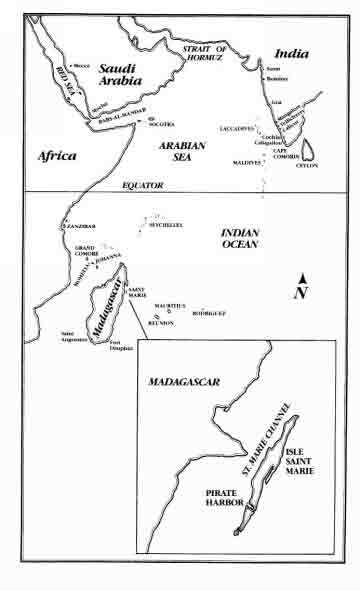 They discovered that Madagascar, although much further away made an excellent place to obtain fresh water and supplies. Madagascar boasted an abundance of fruit, food and fresh water. It had many fine harbours and anchorages. It was unclaimed by any European powers and there was no central native authority. The local tribes were all too busy fighting each other to cause much of a problem to the superior firepower of the invading pirates. When the pirates first settled among the natives, the local chieftains courted them to join their tribe in the never-ending war with their neighbours. Whoever the pirates sided with (and they changed allegiance with alarming regularity) they were sure to be victorious, for the natives had no firearms, nor did they understand their use. So that eventually, the pirates became so terrible a sight to the natives, that if two or three of them were seen on one side when they were going to engage, the opposition would flee without striking a single blow. By these means, they not only became feared, but also powerful. Prisoners of war they took were sold to traders or kept to be their own slaves, as they pleased. They married the most beautiful of the native women – not one or two, but as many as they liked, so that each one of them had their own harem. Quite aside from the pirates’ need for female ‘companionship’ this behaviour had the advantage of creating alliances with the native chieftains. It also produced numerous half-breed children, creating a race that became called Zana-Malata. At the same time, the trade relationship between the settling pirates and American merchants was proving to be extraordinarily profitable. England had imposed many trade restrictions, which meant that merchants and investment syndicates in America found it profitable to send ships, often the captain of which would be ‘ex’-pirates under the guise of licensed slave traders, with goods that the Madagascan pirates needed. On their return, the ships would deliver slaves for the colonies along with gold, silver, jewels and silks – pirate booty captured from the Moors’ trading vessels, bought at low prices. The precious jewels and metals were sent on to Europe, bypassing England along the way, to be traded for expensive manufactured goods, which were then traded on to the colonies. The profits were great all round, which meant it was worth the risks of the long voyage and possible capture by the British trade officials. Tew and his crew rounded the Cape of Good Hope and sailed towards the Straits of Bab-el-Mandeb and the Red Sea. Entering the Red Sea, Tew’s ship came upon a mighty Indian ship bound from the Indies to Arabia. She was richly laden and had 300 hundred soldiers onboard, in addition to its crew of seamen. Tew encouraged his men by informing them of the fortunes that the ship was carrying and that they’d have no difficulty in taking her. Although she was full of men and mounted with a great number of guns, he told them, they lacked the two things necessary: skill and courage. He was proven right, as they managed to board the ship and capture her without loss, the passengers and crew aboard the ship more interested in running from danger than defending the vessel. After examining the cargo, taking what they wanted (gold, silver, jewels and powder) and throwing overboard everything that they didn’t (bales of cloth), each man aboard the Amity received £3,000 as his prize. As captain, Tew received a greater share – the sum of £8,000. The ship turned back to Madagascar in October of 1693, for provisions and upon finding the island “productive of all the necessaries of life, that the air was wholesome, the soil fruitful and the sea abounding with fish,” the ship’s quartermaster proposed settling down there. Only 23 of the crew agreed upon the proposal, the rest stayed with Tew, returning to the Americas to purchase plantations on Bermuda. Here he lived quietly and peacefully, but those of his men who lived near him, having squandered their shares, continually solicited him to take another ‘trip’. He withstood them for some time, but they had gotten together a good crew (using the lure of vast riches just waiting to be acquired) and as one, they begged him to take one more voyage. They were so earnest in their desire, that he couldn’t refuse them any longer. In November of 1694, Tew was given a new license from the governor of New York and sailed in consort with William Want and Thomas Wake, reaching the Red Sea in June of 1695. Tew joined a pirate squadron sailing under the command of Henry Every (Avery). During an attack on one of the big ships belonging to the Great Mogul, Tew was mortally wounded. One account claims “a shot carried away the rim of Tew’s belly, who held his bowels in with his hands for some space. When he dropped, it struck such terror into his men that they suffered themselves to be taken without further resistance.” Thus fell fighting a fine sailor, a brave man and a successful pirate – at least he cheated the gallows that awaited him at Execution dock. It was almost ten years after the pirates first came to the Indian Ocean before they caused a major uproar in India. The man behind the cause of the upset was Henry Every. Before meeting up with Tew and the others, Henry Every had already sailed on several voyages as a mate aboard a merchantman and been employed as a privateer by the Spanish, eventually turning to piracy. Like many other famous pirates, little is known of his life until he emerged from the ranks of faceless sailors to become the captain of a pirate ship. His documented career began in the early 1690s when he was working as an unlicensed slave dealer in the Bahamas. In June of 1694, Every was the second-in-command of a 46-gun private warship, the Charles, under the employ by the Spanish government, sent to attack French smugglers in the West Indies. They headed south along the African coastline, stopping now and again to rob ships of their goods and supplies. On the Guinea coast, under the pretense of trade, he lured some native men aboard his ship and then stole their gold and carried them off as slaves. At the island of Principe he engaged in a hard-fought battle with two Dutch sloops – Every and his men won, burned one of the ships and kept the other to accommodate his growing numbers, swelled by the Dutch sailors who wished to join the pirates “on the account”. They sailed on to Madagascar, along the way burning the second of the captured sloops as the crew aboard it could seldom agree on anything. When they arrived, due to the overcrowded nature of the ship, they were in sore need of supplies. They loaded up on fresh water, fruit and meat and sailed on to the Red Sea. After some plundering in the Red Sea, Every and his men returned to Madagascar for more supplies. On February 28th 1695, Every issued a proclamation that he did not intend to attack any English ships during his voyages – their ships could afford protection by flying the English colours. Every believed in the common opinion that it was acceptable to plunder ships and steal from the ‘Moors’ and that by denying intentions to take English vessels, he figured that the East India Company would leave him alone. In actual fact, quite the opposite was the case: as news of this rather remarkable letter traveled, it brought amazed frustration down upon the company. It was commonly believed that all pirates were English and that the East India Company was conspiring with the pirates against local trade. Every’s letter gave credence to, and for some, undeniable proof of the company’s activities with their piratical ‘partners’. The East India Company representatives were apoplectic with rage. Having restocked the ship’s provisions, Every continued with his plan. The target was to be the pilgrim fleet that sailed annually from Surat to Mocha, where they rested before traveling on to Mecca. On the return journey, the ships would be laden with riches - a magnet to buccaneers. As Every lay in wait, other pirate ships with similar intent turned up. Among the other five vessels was the Amity, Thomas Tew’s ship. The pirate fleet lurked at the throat to the Red Sea, near the strait of Bab-el-Mandeb, but the pilgrim fleet sailed past the them during the dark hours of the night. They would have escaped unscathed but for a straggler that gave them away. A chase began that lasted for five days as Every pursued the pilgrims across the Arabian Sea. Eventually the pirates caught up with their quarry and the first ship to be taken was the Fath Mahmamadi a wealthy merchantman with plunder worth £60,000. More was to come. For Tew, as mentioned earlier, it was to be his own end. A few days later the pirates came upon the Ganj-i-Sawai, a formidable target, as it was the largest ship in the Mogul’s imperial navy, with 40 cannon and 400 rifles. Unfortunately for the captain of the ship, at the start of the battle, a Muslim cannon burst and a shot from the Fancy took out the mainmast, disheartening the men on board. Two hours later, after much fierce fighting, the Muslim captain, Muhammad Ibrahim, fled below decks as the pirates poured over the side of his ship. One tale mentions that in desperation, Ibrahim armed some recently acquired slave girls and sent them out to fight. Shortly thereafter, all resistance to the boarders collapsed and the taken ship was renamed the Gunsway. After days of pillaging and looting, the raiders divided up the treasure and each man received £1,000 in plunder. Every made ready to return to the Americas, but a number of his men decided to stay on Madagascar and so the ship sailed with only a hundred men. After a brief spell in the West Indies and after moving up the east coast of America, Every’s company split into two and separated, one group settling in Carolina and the other (including Every) moving to England via Dublin. Inevitably, some of the men were caught and hanged. With some of his known associates captured, the hunt was on for Every, but he evaded the chase and vanished into legend. The fate of Every is recounted in Johnson’s A General History: amongst Every’s treasures taken from the Gunsway there was a large number of gems and precious stones, not readily usable for money or to trade without arousing suspicion. Hiding out in the town of Bideford, Every sent a message to his friend in Bristol who had contacts amongst local traders, to come and discuss terms as to the disposal of the plunder. The merchants visited him there and Every handed over his jewels to the merchants who claimed that as they were men of wealth and riches, there would be no enquiries as to how they had come by such items. In return for the goods, the merchants allowed Every some small amount of money for subsistence while they disposed of the treasure. Every changed his name and lived in Bideford unnoticed. Soon the little money he had been given was spent and still he had heard nothing from the merchants. He wrote to them many times to ask how things were going and to ask for more money. They sent him a small supply, enough to pay his bills, but not enough for him to eat. Eventually, seeking a satisfactory settlement, he traveled to Bristol to speak with the merchants directly. His reception was less than cordial and the merchants threatened to expose Every to the authorities and thus silenced him. Every fled to Ireland and existed on what little he made from begging. Life was hard and he resolved to return to the merchants and, damn the consequences, would throw himself upon their mercy. Working his passage back, he landed at Plymouth and made his way on foot to Bideford, where he spent a few days before he became ill and died without enough to pay for a coffin. Although the last part of Every’s life cannot be verified, whatever end he met, in India, he left behind him a legacy of fear and hatred towards pirates. Sailing into this came Captain William Kidd, perhaps one of the most famous, or rather ‘infamous’, pirates ever. In actuality, Kidd was not a great or successful pirate. He has been made a myth by writers – fearless, dashing and ruthlessly tyrannical to his crew while he terrorized the Seven Seas. But the truth is that Kidd was a mediocre and unlucky villain. Philip Gosse, the writer of The History of Piracy and The Pirates’ Who’s Who stated “...if Kidd’s reputation was in just proportion to his actual deeds, he would have been forgotten as soon as he had been ‘turned off’ at Wapping Old Stairs.” During his short-lived career as a pirate, Kidd actually made only one voyage and managed to take only one major prize. Details on Kidd’s early life are sketchy: during the Nine Years’ War (1688-1697), Kidd was the captain aboard a privateer ship, the Blessed William, licensed by the governor of Nevis. Kidd and his crew were commissioned to loot many of the French colonies dotted around the Caribbean and in 1689, the Blessed William aided in the sacking of Marie Galante. After a hard battle with French ships, Kidd’s crew decided that a life of piracy was less risky than war and so in February 1690, they stole Kidd’s ship while he was ashore on Nevis. Kidd was given another ship, the Antigua and chased his duplicitous men to New York. Kidd arrived during a civil war and helped the winning side. In 1691 he married a wealthy widow and spent the next few years cultivating relationships with political leaders, amongst which was Robert Livingstone, an entrepreneur with ambitious tendencies. As a ‘sideline’ Kidd continued to harry French shipping along the coast. In 1695, Kidd sailed to England on the Antigua, hoping to obtain a privateering license from Admiralty Court. While in London, he met up with Livingstone and Richard Coote, Earl of Bellmont and the new governor of New York. Between them they came up with a plan to capture pirates and instead of returning the booty to its original owners, they would keep it for themselves. During October 1695, a contract was drawn up and signed by Kidd, Coote and Livingstone. Kidd was to be the captain of a pirate-hunting vessel, for which Coote put up £6,000, four-fifths of the cost of the expedition. Secret agreements stated that Coote would split his takings with four high-ranking partners – these included the secretary of state and the heads of the admiralty and judiciary. These sponsors would keep most of the loot, although King William III was to receive 10%. 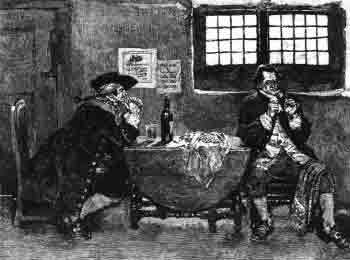 Three commissions were granted by the King: a standard privateering license allowing Kidd to raid French shipping; a special royal decree that meant Kidd could arrest pirates anywhere in the world (Thomas Tew was one of his named targets) and a third that allowed Kidd to keep captured booty. To prevent him form cheating, Kidd was ordered to hand over his loot to Coote in Boston. The Adventure Galley was the ship bought for Kidd’s expedition – it weighed 300-tons and carried 34 guns and 46 oars. It left England in May 1696 and in July and August, Kidd selected a crew in New York. The ship’s articles promised 60% of captured booty to go to the crew, even though Kidd had already promised 60% to Coote. Kidd crossed the Atlantic in September and followed the African Coast to the Indian Ocean. He stopped at Madagascar, careened his ship at the Comoro Islands and recruited more men at Johanna Island. Kidd tuned pirate when he left Johanna in April 1697. Under the conditions of his license, had he wanted to honour it, Kidd could have taken many pirates at the nearby Sainte Marie Island. Instead he weighed anchor and headed towards the Red Sea to await the pilgrim fleet returning from Mecca. August 15th saw Kidd and his crew caught up with an Indian squadron that was accompanied by an East India Company ship. When the British ship opened fire on his vessel, Kidd retreated and fled to northwestern India. On August 19th, he and his men captured a small vessel, tortured the Indian sailors, took food, money and forced the British captain to sail with them for a few months and act as pilot. Kidd continued south, following the coast past Kárwár and Calcutta, engaging two Portuguese warships in September and stopping off at the Laccadive Islands for repairs. The islanders were forced to work for free while Kidd’s men mistreated the islanders and raped the women. In early November, Kidd and his crew ran into another East India Company ship. Most of the crew were up for an attack and voted as such, but Kidd managed to bully and cajole them into letting the British ship go. Some two weeks later, Kidd became involved in an argument with William Moore, the Galley’s gunner, over whether or not to attack a Dutch vessel they happened upon. Moore wanted to attack the passing ship and during the altercation, Kidd killed him by smashing an iron-banded wooden bucket down on his head. Two more prizes were taken off the coast of India: at the end of November he took the Rouparelle, which though it was owned by Dutch merchants, it flew the French flag and carried a French pass. Kidd renamed her the November, sold the cargo and shared the loot amongst the crew; about a month later Kidd and his men took a small Indian vessel. On January 12th 1698, Kidd was sailing off Cochin when he took his only rich prize – the Quedah Merchant, a vessel leased to the Indian government, but carrying French papers. Kidd kept the Merchant and her crew and sold some of the cargo before continuing south. Along the way they seized a Portuguese vessel but were unsuccessful in their pursuit of two East India Company ships, the Dorill and the Sedgwick. The Quedah Merchant caught them up a month later and the booty was divided up, Kidd keeping 40 shares for himself, as stated in the ship’s articles. When Culliford sailed in June 1698, most of Kidd’s men went with him on the Mocca. Come November, Kidd burned the now rotted Galley and departed aboard the Quedah Merchant, which he had renamed the Adventure Prize. The attack and capture of the Quedah Merchant threatened the East India Company’s future in trading with the east. The Mogul was already seething over Every’s plundering of the Gunsway in 1695 and further enraged by the capture of the Merchant, he threatened to expel all European traders. With great pressure upon them, the company managed to convince the Great Mogul otherwise by awarding great amounts of compensation to the owners of the Merchant’s cargo, paying a great many bribes and agreeing to instate a patrol of the South Indian Sea. Temporarily mollified, the Indian officials continued to blame the company for any new pirate attacks. Kidd had to be punished for his crimes and to answer Indian complaints. British officials branded Kidd a pirate and omitted him by name from the general pardon that was issued in 1698. In November of that year, the government ordered all colonial governors to instigate an all-out manhunt for Kidd and his men. When he reached the Caribbean island of Anguilla in April 1699, Kidd received the news of his new status of pirate and a much-wanted man. The Danish governor of Saint Thomas refused to offer any protection and so Kidd sailed from island to island looking for a safe haven. Kidd switched ships, buying a sloop from a British trader on Hispaniola and sailed up the coast of America. Figuring himself to be safe with the Earl of Bellomont and his other sponsors, Kidd made his way towards Boston. He presumably felt that they would be able to extricate him from his current predicament, as some of the sponsors were legal men. He did not know, however, that parliament had been so alarmed by the actions of a man in Kidd’s position that they had made inquiries concerning the commission that was issued to him. The investigations would lean heavily on Coote and his cronies. Someone had to suffer as a scapegoat for the aristocratic company privateers and the lot was to fall to the luckless Kidd. Kidd made stops at New Jersey and Long Island before he entered Boston harbour, myths and rumours stating that he did so in order to bury his huge amount of booty. Legendary buried treasure that has not been found to this day. He was arrested by Coote in July 1699 and sent back to England for trial, reaching London in April 1700. It was after a year of imprisonment that Kidd finally went to court in a session of Admiralty at the House of Commons in March 1701. The case was a scandal and became embroiled in British politics. The opposition party tried to accuse Kidd’s sponsors of crimes against the state and improper conduct in office, but the impeachment motion failed, albeit narrowly. The sponsors felt that only Kidd’s execution could silence him as a dangerous witness. In May of 1701, Kidd was tried and convicted of the murder of William Moore and of piracy. Kidd met the charge of pirating with claims that the Rouparelle and the Merchant were perfectly legal targets under the conditions of his license, as they were carrying French passes and operating under the French East India Company. The vital evidence of the papers Kidd had taken from the two ships was asked to be examined, but Kidd had foolishly handed them over to Coote when he was in Boston. It was claimed that they had gone missing and could not be produced during the trial, even though they had recently been exhibited before the House of Commons (the tragic fact is that the documents were not destroyed at the time, but were discovered 200 years later in the Public Records Office – way too late to make a difference to the outcome of Kidd’s trial). With the East India Company pushing for a prosecution and Kidd’s sponsors in danger should he make any damaging disclosures, it was only a matter of time. Kidd didn’t have much a chance. As it happens, the charge for which Kidd was hanged was murder. Even though Moore was mutinous and Kidd, in position of captain, was perfectly justified in knocking him down and even killing him, the court intended Kidd to swing and so, it was enough to find him guilty. The unfortunate Kidd was hanged at Execution Dock on the Wapping waterfront, May 23rd 1701. But Kidd died hard – the rope with which he was first hanged broke with his weight and he tumbled to the ground. He was hanged a second time, with another noose, more effectively. 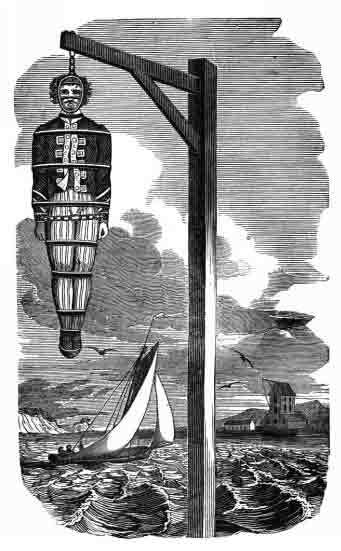 Afterward, his body was placed in chains and gibbeted further down the Thames on the shore near Tilbury Fort. Thus ended the career of Captain Kidd, who like many other pirates before him, left behind tales of his deeds and myths of buried treasure. Kidd, though less successful a pirate, became one of the most well known, even having his own 24-verse ballad, sung to commemorate his life and death. With the royal decree of clemency in 1698, many pirates surrendered to the conditions of the pardon and coupled with a regular patrolling of warships around the Indian Ocean and Red Sea, piracy in and around Madagascar was reduced to the occasional occurrence. Most pirates settled down on Madagascar, enjoying their booty, taking wives and trading in slaves. Almost no pirates, with the exception in 1704 of one John Halsey, crossed the Atlantic, preferring to operate closer to home in the Atlantic and Caribbean. No notable pirates prowled for many years until Woodes Rogers’ success in taming piracy in the Bahamas sent a new wave of pirates to Madagascar in 1719. It was a man named Christopher Condent that led the return to the eastern seas. Condent and his crew fled New Providence in 1718 when Woodes Rogers became governor of the island. On the trip across the Atlantic, an Indian crewman, who had been beaten and mistreated by the other pirates, threatened to blow up the ship’s powder magazine, Condent leapt into the hold and shot him dead. In a barbaric display of relief at having been saved from an almost certain end, the crew hacked the body to pieces, while the gunner ripped open the corpse’s belly, tore out the heart, boiled it and ate it. The crew divided when they took a merchant ship a little further into the voyage. Half of the men sailed away on the captured vessel, the other half chose Condent as their captain. At the Cape Verde Islands, Condent and his men took a Portuguese wine ship, an entire squadron of small boats and a Dutch warship. Condent kept the warship and renamed it the Flying Dragon. The Dragon cruised the Brazilian coast for a while as Condent took more merchant ships and on occasion cruelly torturing Portuguese prisoners by “cutting off their ears and noses.” He took many more prizes when he reached the African coast and reached Madagascar in June or July of 1719. While he was at Sainte Marie, he picked up some of John Halsey’s old crew. He went on to cruise the Indian coast and the Red Sea for a year or so. It was near Bombay in 1720 that Condent captured a large Arab ship, packed with treasure and precious cargo to the value of more than £150,000, the richest prize in twenty years. Hoping to avoid the wrath of the already irate East India Company, Condent ordered his men not to abuse the crew and passengers. They returned to the island of Sainte Marie and divided up the booty, each man receiving about £2,000. Condent and 40 other members of his crew sailed to the island of Réunion where they negotiated with the governor there for a French pardon. 20 or more of the men settled there on the island but Condent, according to Defoe, went on to marry the governor’s sister-in-law, traveled to France, settled down with his wife in Brittany and became a wealthy merchant. 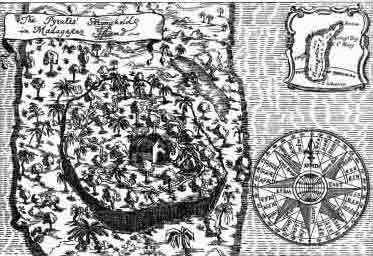 Other pirates followed Condent from New Providence to Madagascar – namely Edward England and John Taylor aboard their ship the Pearl. They scoured the African coast, from Gambia to Ghana and managed to take more than two dozen vessels. Some they looted, some they burned. They kept one and renamed it the Victory, the command of which was given to John Taylor. Stopping at an isolated bay to careen the ships, Defoe states that they “liv’d there very wantonly for several weeks, making free with the negroe women and committing such outrageous acts that they came to an open rupture with the natives.” It was past time to move on. The Pearl and the Victory stopped to take on provisions at Madagascar in early 1720. They went on to loot several vessels along the Malabar Coast of India and England swapped the Pearl for the 34-gunned Fancy. They returned to Madagascar for more provisions and then made for Johanna Island where, on the night of August 27th 1720, they found three large English and Dutch ships, trading with the East Indies. The two Dutch ships fled, but James Macrae, the captain of the Cassandra bravely fought off the pirates for some hours. Both the Cassandra and the Fancy became grounded and as they sat there, they bombarded each other with broadsides. Eventually Macrae and some of his crew escaped ashore and fled into the jungle, leaving behind a cargo worth £75,000, according to some reports. The Cassandra lost 37 men while the pirates suffered casualties of more than 90. After hiding out for a week and a half, hoping the pirates’ anger had cooled down somewhat, Macrae went aboard the Victory seeking mercy. 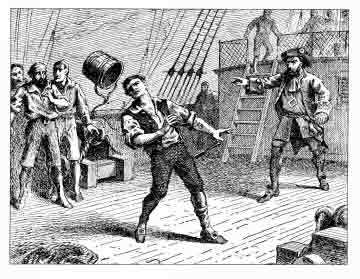 Many of the pirates, still angry at the loss of crewmates wanted to kill him, but others who had served under him in the past and still had respect for him, argued to spare Macrae’s life. England and Taylor argued long and hard about Macrae’s fate until Taylor was softened up with rum. Macrae and his men were allowed to sail away on the half-ruined Fancy. They reached Bombay seven weeks later, suffering from hunger and dehydration, after a terrible journey. Macrae was rewarded by the East India Company for his bravery and was he promoted to governor of Madras from 1725 to 1730. However, the pirates turned against England because of his show of mercy with Macrae. He was removed from captaincy and in early 1721, he was marooned on the island of Mauritius with three others. The four of them managed to sail to Madagascar in a small boat. Here England lived on the charity of other pirates and died a pauper not long after. Taylor then joined Olivier La Bouche and together in 1723, they looted a Portuguese vessel containing £500,000 in diamonds and cash as well as a further £375,000 in valuable Oriental products – the richest prize ever taken from Madagascar. Soon after, the pirates heard that a squadron of warships under the command of Commodore Thomas Matthews had rounded the Cape of Good Hope. Although the naval patrol was not a serious threat, its presence was enough to scare off the pirates. Taylor fled back to the Caribbean with his share of the booty and La Bouche sailed to Réunion where he retired form piracy.